Hello everyone, great resource here. Thanks! So i’ve had my MD SPS-1UW+ MKII for a few months and have figured out RAM / ROM sample world. Saving kits / grooves is my next challenge. BUT… really want to start sending samples from my computer using C6 and the TM-1 interface. 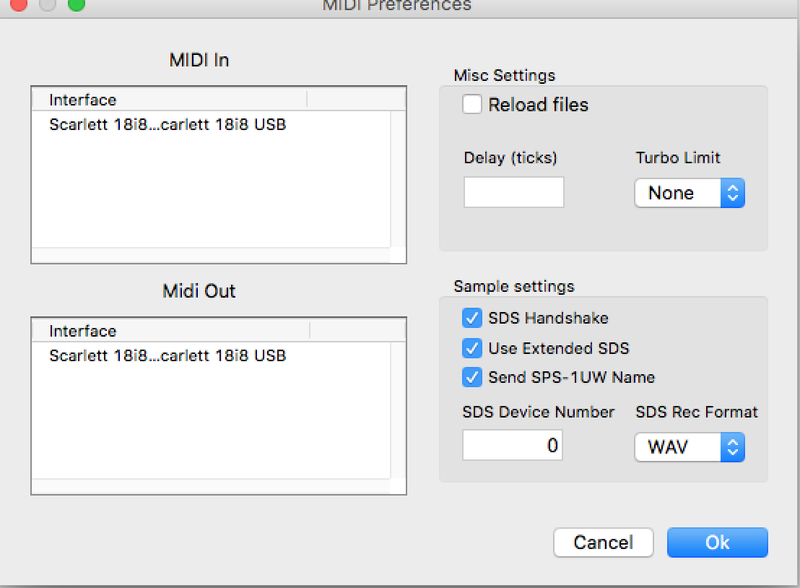 I downloaded the C6 software / plugged in all necessary midi cables in the correct ports… i then tried sending one 30 second long sample (it was an mp3 but figured out it has to be a WAV.?) - hit send and MD just said Waiting… for eternity. Question- sample has to be under 30-40 seconds and must be a WAV. ?? also my Turbo light will not turn on at all during / throughout send process. What’s happening ? what am i doing wrong? Is my computer’s OS (apple high sierra 10.13) incompatible with my MD or the TM-1 or the C6 software? should this dialogue box in C6 say TM-1 anywhere? i have my tm-1 plugged into an open usb port in the computer and also have my scarlett plugged in as well. Could this be the hassle? .maybe not… if i unplug my scarlett its still never says TM-1 anywhere in this dialogue box. Should it? thanks! I’m running 10.13.3 and the TM-1 works. Maybe try another USB port. The TM-1 should flash if it has got USB power. after trying two different usb cables and both usb ports on my mac the tm-1 still doesnt’ work. guess i’ll buy a brand new cable ? I’m out of options. How is it the ports won’t recognize the tm-1? Find it hard to believe there’s no solution. I sorted my Mac connection issues with a tm-1 firmware update found on the support page. The process might help even if you already updated to the latest version. But you’ll need a computer that detects it. Maybe there is a way to reset it or start it in recovery mode. A ticket might be needed for that. with what OS were you able to update the firmware? I think it was in High Sierra. It should also work from Windows running in a VM (Parallels). Hope you get it back to work, and open a ticket if you don’t. There must be some way to flash a working firmware in the tm-1.